Some sounds can make silence both more silent and more beautiful. The crashing of the waves on an empty beach, for example, create a haven from city noise, drowning out traffic and making you feel like you're the only around for miles. The calling of the gulls are the only voices, and if it weren't so lovely it would be lonely. But there's a primal feel to it, where even the sting of sea-breeze blown sand on your ankles is pleasant, and the salt-laden air may be occasionally burdened by the foulness of decaying sealife, but even along the crab-corpse strewn beach debris it's still salt-scented, still better and fresher than the odors of streets. Though in February the seabreeze cuts ice cold, and you're not quite sure on getting home if you're sun-burned or wind-chapped, it's still a walk in the sand. 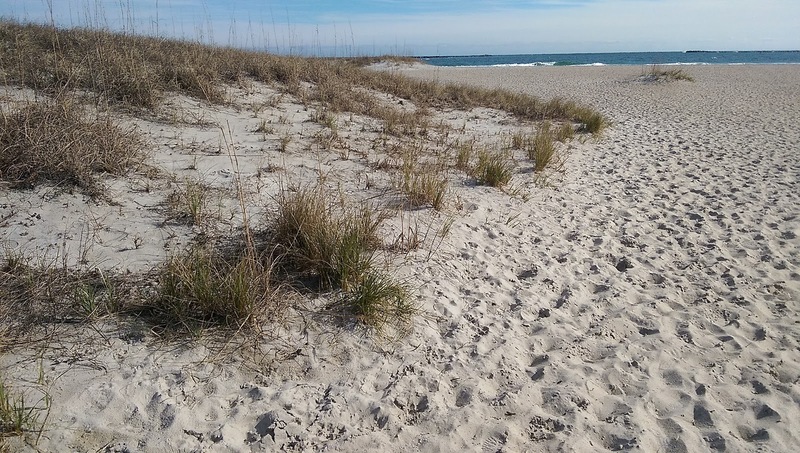 Though the sand blows into your sneakers and grits between your toes, and gives way beneath your sliding steps as you walk, making every half mile the effort a full, you feel more refreshed for having made the effort. And though the wind cuts through your jacket, the sun fights to warm you, so you're never quite at the wrong edge of cold, even if your skin when you get home is red and your hands white despite hiding in your pockets. Even in winter throes, the beach has an innate beauty that soothes the soul. Especially in the sort of winter when a little silence is the balm you may have needed anyway.